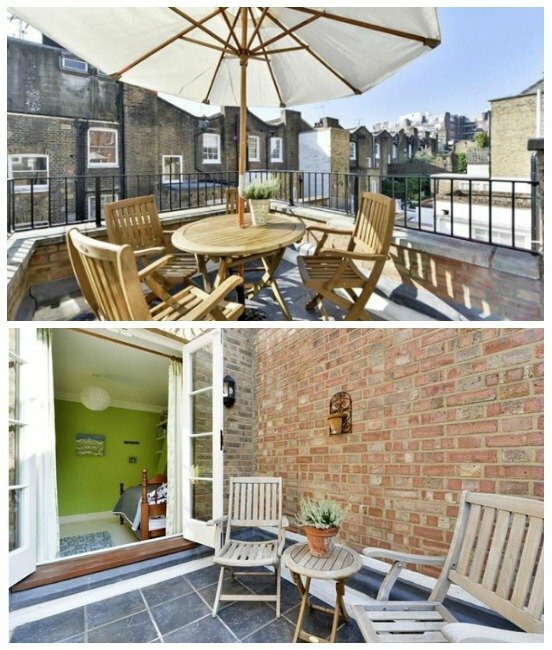 A beautiful apartment in London … but find out why it might not be the perfect property after all! 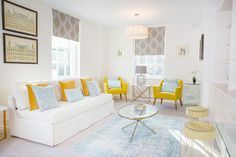 When you’re looking at apartments and homes for sale in London, there are many attractive properties that might at first glance (and even after multiple visits!) seem like the right home or investment for you. If you’re searching for that perfect property in London, then we invite you to read our Top 10 Tips for Buying an Apartment or Home in London. There you’ll find our advice on what makes the best properties, whether you’re looking for a home away from home in London or a rental property investment in one of the world’s most exciting and appealing cities. Yet, with all the properties on the market, there are traps even Londoners can fall into, as well as mistakes settling for a good property when a perfect one might be just around the corner! We suggest reading our tips, doing your homework and even contacting us if you have a question. Our goal is to rent and manage beautifully remodeled properties in only the best locations. We’ll give you the straight scoop before you buy! 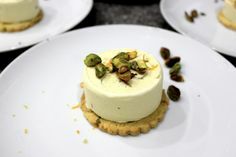 That’s precisely what a former London Perfect guest did. After making the move to London, she began a search full time on her own for a home in London. Keep in mind she was currently living in London and had plenty of time to search and visit properties. 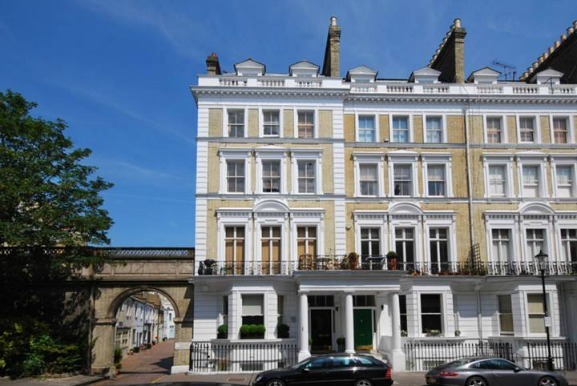 Following our tips to search in Kensington, South Kensington and Chelsea for the most desirable neighborhoods, she found a beautiful, fully remodeled lower ground level apartment with outside space in a great location in South Kensington. The living room was spacious and the kitchen fully remodeled – move in condition! 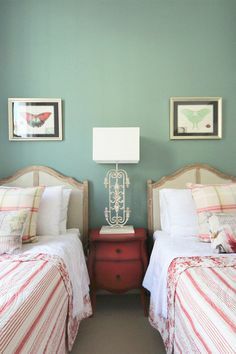 She had followed many of the tips, the location was excellent – along a beautiful street and set next to a charming mews – and the quality of the remodel very nice. The price was good for a very spacious three bedroom, two bathroom apartment with an outdoor terrace in such a great neighborhood. They were smart property searchers and had already checked that there was a share of freehold being offered and found out that the property could be rented short term without any restrictions. After exploring the neighborhood and seeing how close it was walking to the nearest Tube stations, bus lines and best restaurants, they also took a good look at the property through the eyes of a traveler since they also wanted to find a property that would be appealing for vacation rentals in the future. This one seemed like it met all the requirements, and it even had a nice outdoor space. 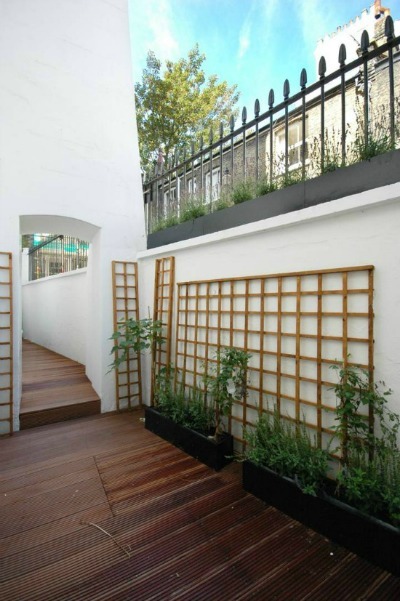 Outdoor space – always an appealing factor when searching for properties in London! Just before they were ready to put in an offer, they asked for our advice. We took a close look and also sent it to a trusted search agent, Suzanne, for more advice. She knew the property right away and that it had been on the market for awhile. Hum, already a good hint that something might not be quite right! While it’s true that it is a lovely remodel, the main problem Suzanne emphasized was that it was a lower ground floor apartment. Yes, a basement. How will the property fare if you decide to sell in a weak market? Will it sell last or not at all? Carefully consider outdoor space – where is the terrace and what are the views? Where are the rubbish bins stored? Will it be the first thing you see? How much light is there? One of the biggest concerns for buyers! While a basement may seem light, it will rarely be as bright or as appealing as an upper level apartment. Suzanne sent us an example of a property that she though hit all the marks for location, London charm, investment potential, beautiful remodel and attractiveness as a vacation rental home. 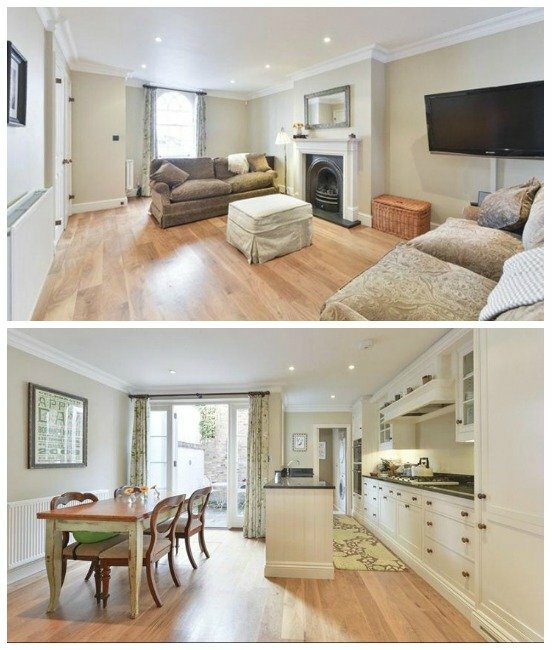 Let’s take a look and see just why this London townhouse was such a gem that it was snapped up right away! This beautiful brick facade townhouse was set on a quaint and quiet one-way street in Kensington surrounded by Notting Hill, excellent shopping and dining spots on Kensington High Street and Kensington Gardens. Ideal location! The property featured three bedrooms, three bathrooms and three outdoor patios and terraces. 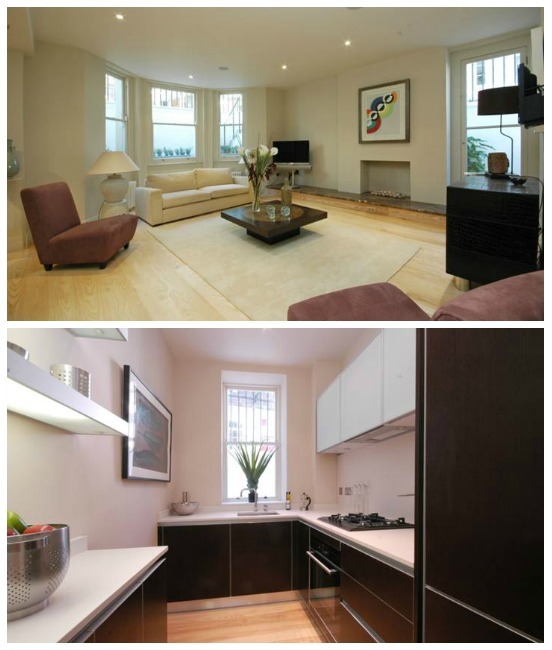 Large living room and a beautiful kitchen and dining area leading out to a private terrace. Now that’s London charm you can bank on! Suzanne recommended this property for several reasons, in addition to the excellent location. She also noted that it was charming inside and out and that it had been tastefully remodeled to a good standard. She pointed out that the new owners could move in right away while still being able to add their own personal touches without spending too much. Suzanne also highlighted the three outdoor spaces in this property, which are highly desirable. With a patio off the dining area and kitchen and two roof terraces you’ll have plenty of space to enjoy outdoor living as well. She also noted a small front garden that is ideal for bikes. Charming outdoor spaces … makes all the difference! An experienced search agent like Suzanne will also be able to point out the future potential in a property. 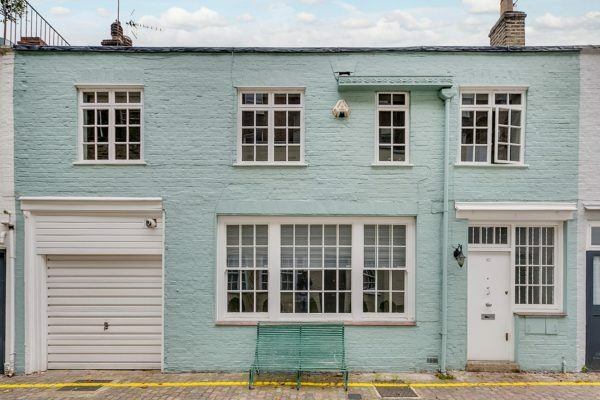 With this Kensington townhouse she also noted that for someone who wanted even more space, this home would also be a good candidate for a basement. Since there are patios at the front and rear, you would be able to have light wells and windows to the basement, meaning it will get natural light. 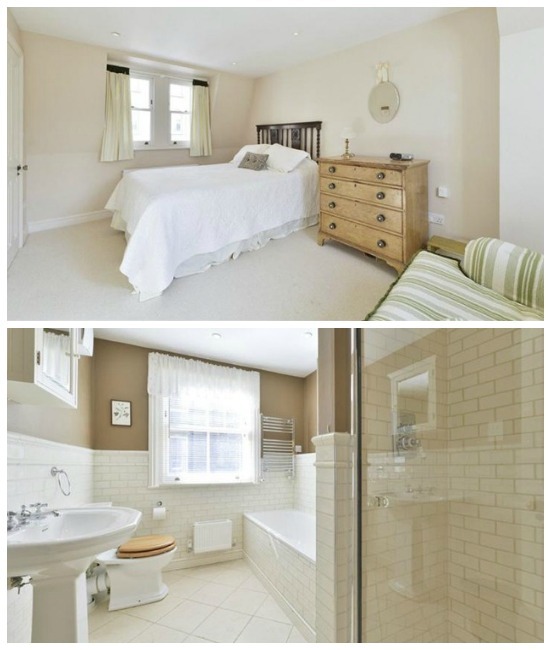 With this additional space you could increase the future value of the home, which would be a huge plus! We hope this has been a helpful comparison between two properties – one that seemed nearly perfect and one that truly was! It can be tricky finding the right apartment or home in London, but it’s worth the time searching. 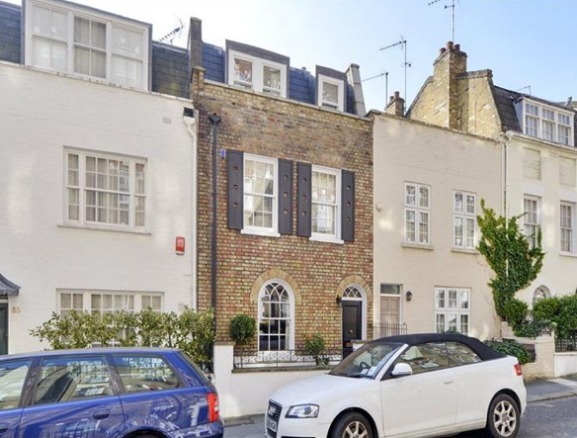 Even if you live in London it can be hard to find the best property without help. Take your time, feel free to contact us for advice or to put you in touch with Suzanne for more assistance finding the perfect home in London! 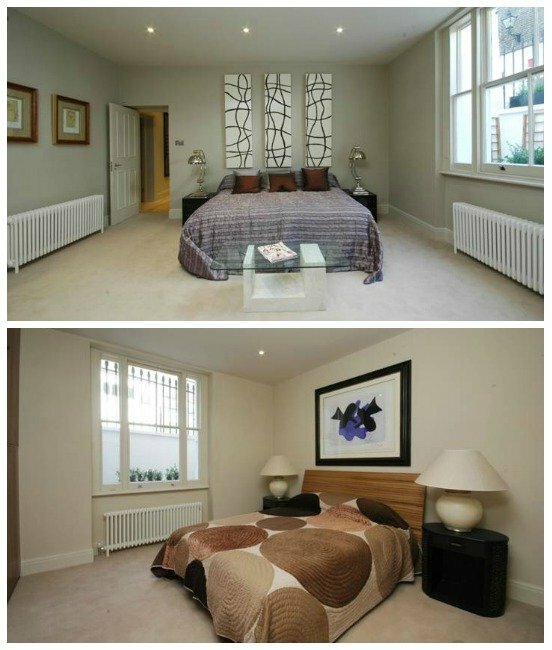 Posted on Thursday, January 23rd, 2014 at 12:49 pm in Buying Property in London. You can follow any responses to this entry through the RSS 2.0 feed. You can leave a response, or trackback from your own site.